What if you spent a week in a country… and didn’t end up meeting a single person who is an actual citizen of the country? Hotels, banks, Uber drivers, waiters… everyone you came into contact with – they were all from somewhere else. According to local demographic data, around 88 percent of the 2.7 million residents of Qatar are foreign born (people I spoke with at Qatar put the percentage of foreigners closer to 95 percent). There are hundreds of thousands of citizens of Nepal, most of whom are there to work on the construction of stadium and railways for the 2022 FIFA World Cup that’s being held in Qatar. And there are also lots of people from India and Bangladesh… and people from everywhere else, occupying a vast range of construction to white-collar jobs. But Qatar isn’t alone for its citizens being vastly outnumbered by foreign residents. It’s joined by the United Arab Emirates – a fellow rich Middle Eastern commodities state – as being run by foreigners. There are also a lot of foreigners in Hong Kong and Singapore, according to the United Nations – but nothing like Qatar. By comparison, just 14 percent of residents of the U.S. are foreign-born. And only 1 percent (and that might be rounding up) of people in China come from somewhere else. 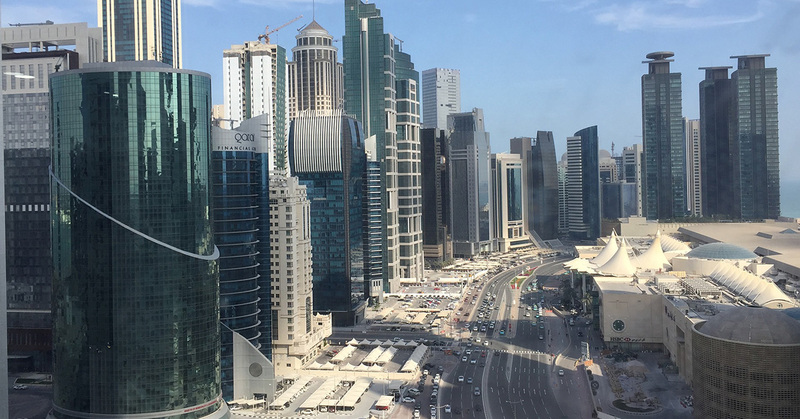 Qatar can get other people to do its work – build roads and stadiums (for the 2020 World Cup), run banks, manage hotels, wait tables, manage dairies – because it’s so wealthy. The country’s GDP per capita of US$125,000 is more than double that of the U.S. It’s 42 percent higher than Singapore. If I had a dollar for every time that a taxi driver in Doha, the country’s capital, pointed to a gaudy structure behind a big white wall and told me it was a residence of a member of the royal family (there are lots and lots of them), my stay in Qatar would have been complimentary. For example, downtown city markets – whether it’s gold or fruit or spices or … in Osh or Bangkok or Tehran or Mexico City or anywhere in between – are usually disorganised, messy affairs… featuring rabbit warren streets and haggling stall hawkers and tourist junk and undiscovered treasures. That’s not the case with the souq (market quarter) in Doha, which reminded me of a Tintin-meets-Disney market. It’s clean, neat, quiet and devoid of character. It makes a Lower East Side sidewalk jewelry market where artsy millennials sell US$150 pendants to sandals-clad West Villagers feel crazy and chaotic by comparison. That’s not to say that Doha’s souq isn’t fun. The evening buzz – lots of people milling about and eating Iraqi food at tables on the sidewalk – is pleasant (if beer-free). The weather in February is nice. I bought my son a cool World Cup 2022 scarf. But if you’re looking for authenticity, look elsewhere. When Tamim bin Hamad al-Thani, the current leader of Qatar, was a teenager, his parents had tennis legend Boris Becker brought over to give him tennis lessons. Wander around Doha, and you’ll see breathtaking, bleeding-edge architecture by the world’s most renowned architects. The many malls that dot suburban Qatar make Dubai’s extravagant cathedrals to excessive consumerism seem like sidewalk chapels by comparison. And one auto dealer has so many extra Rolls Royces in stock that it stores the overflow in a nearby parking garage. Extravagance has a middle name, and it starts with a “Q”. Qatar is smack in the middle of a rough neighbourhood. And since June 2017, it’s been under a blockade. You see, in June, Qatar’s neighbours – Saudi Arabia, Bahrain, Egypt and the United Arab Emirates – closed their borders with Qatar. That means there’s no flow of goods, people or capital between these countries and Qatar. No imports or exports… no tourism or flights or cars… no visiting businesspeople… from its most important economic and political counterparts. That was thanks in part to U.S. President Donald Trump. Qatar has long been a friend of the U.S. A military base in Qatar has been home to U.S. forces since 2001. The 10,000 troops here have been an important base for U.S. operations against ISIS. But despite that, in May 2017, Trump used his first trip to the Middle East to call for more support in the war against terror. This helped lead to Saudi Arabia, the UAE. and Bahrain cutting diplomatic ties and blockading Qatar in an attempt to get it to crack down on its alleged connections with terrorism and distance itself from Iran. Trump supported the blockade. Still, all things being considered, Qatar has managed to weather the blockade better than a lot of people thought. And the country’s economy is still forecast to grow by nearly 2.6 percent this year. It’s never too late to start creating wealth… Here’s why.